new to us, but within. the messages of yore for us to apply. Visit frequently for new, innovative publications. NOTE: PayPal accepts credit cards, without a PayPal account. Click the PayPal button and scroll down to the bottom of the PayPal page to view the credit card option. Our Shop for eBooks reveals NewAncient™ Secrets. 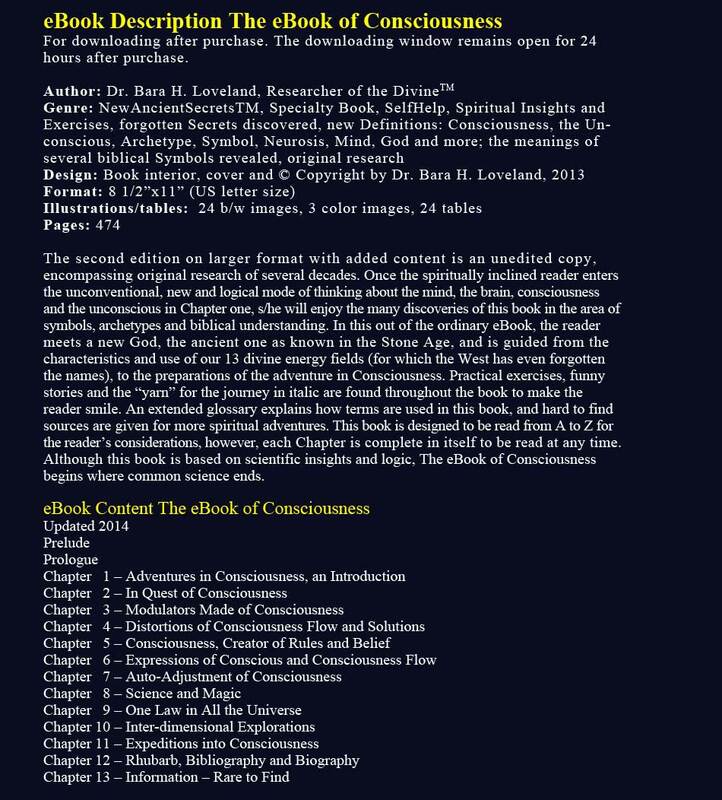 Check out our eBook on Consciousness with a new definition Consciousness, offering spiritual knowledge and instructions. WHAT YOU FIND UNIQUELY HERE NewAncientSecrets™ is dedicated to bring you knowledge mainly from original research that has not been widely known, is new or has been long forgotten – that is, secrets of the ages you may not find yet in any other book, since such knowledge is mainly the result of decades of innovative studies, often reached in naturally altered states of awareness! NewAncientSecrets™ presents integrative science and religion and that what was holy for humankind through millennia. Discover practical applications and humor, enrich yourself with spiritual and other secrets and gain new points of view: the ancient ones that have been symbolized and forgotten, addressing our sacred energy fields, as found in holy symbols from the Stone Age and in the holy scriptures of the Bible, of which today’s churches do not know. Learn about Consciousness, Human Rights, Color*Medicine™, Self-Help, and Self-Improvement, beautiful native and contemporary art and its symbolic meanings; likewise, learn about the origin of symbols, which may appear in your dreams, and much more. Indulge: the present sales prices are hard to beat! Please visit frequently for more and unique topics and rare to find information that will be upcoming. You may not want to miss a single one of these informative and inspirational eBooks! HOW TO PURCHASE AND DOWNLOAD You may purchase our unique and exclusive products as soon as they become available in the PRODUCT DESCRIPTIONS listing. For Product Descriptions you may also click the underlined title of the product you select in the listing below, or scroll down to the bottom of this page. If a product title is not underlined, then the product is in preparation: you may want to visit later to check its availability. You can download the available products within the given 24 hour time frame by clicking PRODUCT DESCRIPTIONS and then the BUY NOW button. PRINTING THE eBOOKS The eBooks are designed for a one-time double-sided printing in color or b/w. The covers may be printed on cardstock as the printer allows. The covers should be protected by clear sheets before spiral-binding the eBooks at a copy center. The eBooks may have blank pages adjacent to the cover pages and after the chapter titles, or as designed. eBook format on this website: 8.5" x 11", U.S. letter size (21.59cm x 27.94cm); DIN A4 equals 21cm x 29cm. Most eBooks are hot “out of the pan” of the author(s) that is, unedited. Click here for the book description, Phenomena of Mysticism - UnSernoned. Please visit again for our next NewAncientSecrets™ ePublication(s). Click here for the book description, Perceptions of God MindMade. Click here for the book description, Galactic Origin of Human Genesis. Click here for the book description, A Chance for Peace. Click here for the book description, Wheels of Wonders. Click here for the book description, GMO or OMG. Click here for the book description, The Holy Land - War and Peace. Click here for the book description, Adoration of the Madonna. 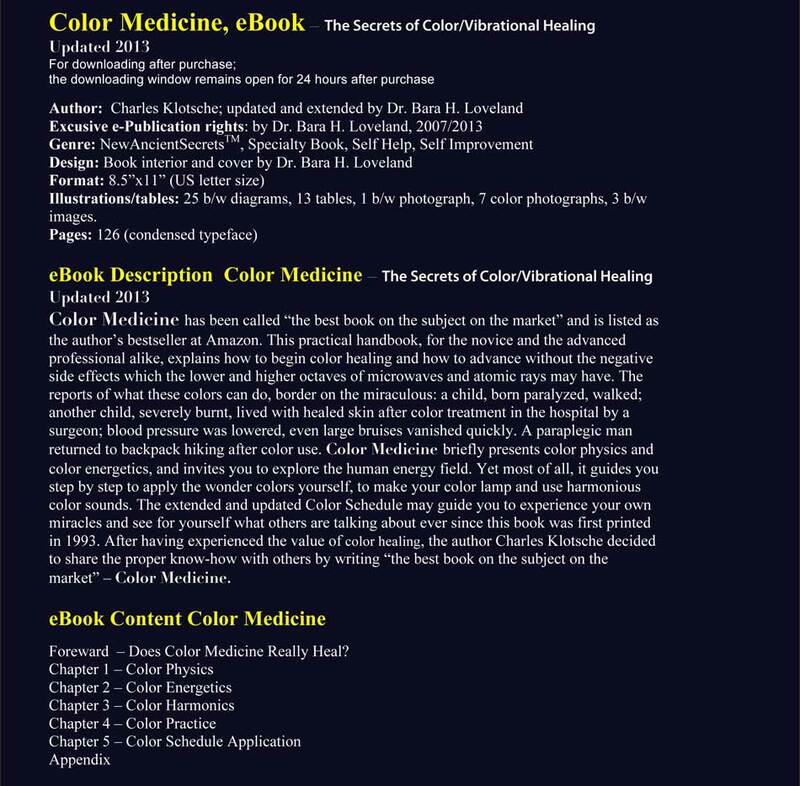 Click here for the book description, Color Medicine. 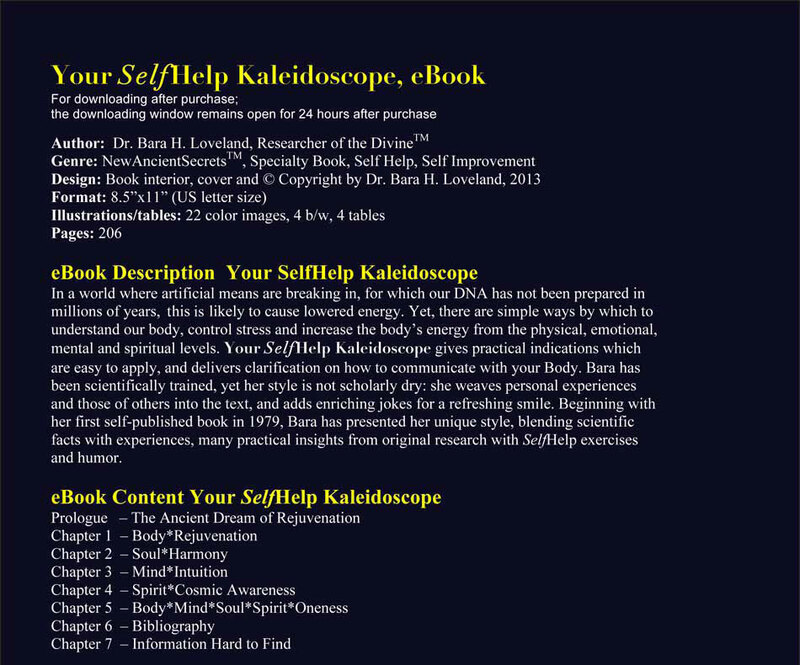 Click here for the book description, Your New SelfHelp Kaleidoscope. Hier klicken zur Buchbeschreibung/Click here for the book description, Zeitalter des Gefühls. Introductory ePrice for a limited time: $ 9.98. Click here for the book description, The eBook of Consciousness. Click here for the book description, Heaven and Earth Mother. Click here for the book description. The (W)Hole eBook on Mimbres Pots. Click here for the book description, The Scorpion eBook. For downloading within 24 hour after purchase. Genre Space, Science Fiction, Awareness, New Age, Spirituality, Mental Adventure, NewAncientSecrets™. Description Even those skeptical of other than mainstream views may be surprised how the author explains why a different insight concerning creation is equally valid. There are so many mysteries, unsolved by common science, which begin to make sense from a broader point of view. Common science finds that the Great Pyramid of Giza, Egypt, was a burial chamber yet it has not come up with one item of proof that this was so. However, the Pyramid was in use for something, what could it be? And how was it erected with heavy blocks brought from miles away? With rollers and a 1,000 slaves? It does not seem to make sense, since its plane surfaces fitting so neatly together, had to be done in place. Could the ancient defy gravity? Is there an exercise the reader can do at home to prove some of the ancients’ heavy lifting ability? A similar mystery are the fitting blocks in the walls of Machu Pichu in Peru, South America: so tightly placed that not even a razor blade can fit between them. How would the ancient “primitive” people be able to create such walls and carry them up the high mountain in the thin air altitude? There are more mysteries the author addresses: why is the Saragossa Sea, South-East of Florida, USA, less deep than the Atlantic Ocean, and why do planes and ships disappear in the Bermuda Triangle area without a trace? Is there an answer? How can the vast enormous underground cities in Turkey be explained, which are up to 16 stories deep? What could the world’s stories of Giants be all about, even mentioned in the Bible? Are or were there higher beings of good or bad intent on Earth and if so where do or did they come from? Do they bring spiritual secrets or hide them from humanity? Is a modern newspaper acknowledging the expectation of space brother visits with its announcement of space craft repair? Why do the Zimbabwe stone walls circles, connected by passages, emit certain frequencies? The author gives descriptions and details gathered form his own point of view and that of many others. It is an awareness expanding book, which is entertaining at the same time. Galactic Origin of Human Genesis. Genre Religion, religious philosophy, NewAncientSecrets™, spirituality, ancient symbolism. Key Words Bible and Stone Age symbols, Mother Goddess, Father God, spirituality, God in heaven, God within, monotheism, pantheism, life energy, male/female value shift, Native American symbols, Mimbres, Tantra, mind, the unconscious, Christ, rational mind, tie and bow tie symbols, Tibetan Dorje symbol, cerebrum, . Description Could it be that the ancients left us spiritual messages we mainly failed to recognize? Could the ancient symbols teach us about our own spiritual abilities? In this eBook, Perceptions of God – MindMade, the author reveals secrets that were hidden in Native American and Stone Age symbols as well as in ancient scriptures. Suddenly we may become aware of the mind set of our forbearers and why there was a Mother Goddess of peace – world-wide. We may realize why the sun cult was so important to our ancestors and how drowning was related to baptism. The author shows the “uneven” twins of Mother Goddess and Father God, separated by 25,000 years and explains why Zeus gives birth to Athena and how! It shows that the heart originally was not the heart organ and why there was a black and a gold Pharaoh in Egypt. This eBook reveals how a spiritual error led to the suppression of women and also, what was symbolically meant by circumcision. It explains why the peace age of the Mother Goddess ended after millions of years and shows why the transition to Father God and gods slowly took place, following the new mind set of people, “modernized” around 2,000 B.C. It further elucidates why Jesus-Yeshua was riding on a donkey into Jerusalem, a message the Romans could only suppress till now! This book may update school books and update religious understanding concerning the very ancient times when people were spiritual and able to work miracles. We still have the organs to do likewise (if GMOs do not swart our spiritual heritage) and perform miracles as Jesus said we can do: we only have to remember! Genre Humanities, Politics, Religion, NewAncientSecrets™. Description With his book A Chance for Peace, John Bigelow Loveland MMsc presents a well-researched work, looking first at what constitutes the lack of peace. He finds three value systems, each commonly upheld in different societies yet not necessarily agreeing. He turns to religion and politics for peace-making and finds both helping and hindering under certain circumstances. The author addresses the question, “Are there ways to peace in one region, leading to world-peace?” He finds solutions which people and governments could take to heart if they want peace: a world law with equitable politics and tolerance toward “neighbor” religions, honoring the Declaration of Human Rights, and more: John Bigelow Loveland MMsc amazingly foresees (2007) the circumstances and possible outcome for Iraq yet glimpses world peace manifesting in time. In A Chance for Peace, John Bigelow Loveland MMsc lays the foundation for his later books, The Holy Land – War and Peace and Wheels of Wonders, both detailing humanity’s way back to peace, the former presenting the only workable solution for the Holy Land, the latter guiding individuals who desire the awakening of their divine powers. A Chance for Peace is a must-read for all peace lovers, wondering why world peace is just not coming about, not yet, and how it can be manifested. This book by John Bigelow Loveland MMsc, A Chance for Peace, is excellently researched and shows his broad and profound knowledge in numerous fields. He explains what each individual, each group, and each government can do to manifest peace. The author has lived peace in his own life and clearly sees A Chance for Peace for all! IX Statements by John Bigelow Loveland, MMsc. Genre Spirituality, Bible Symbols, Religion, Metaphysics, NewAncientSecrets™. Description In his book, Wheels of Wonders, John Bigelow Loveland MMsc, brings together the knowledge of millennia of the Chakras (from Sanskrit cakra, wheel), refered to in the Bible, the Vedas, and the Upanishads as well as in myths and fairytales. The traditional Christian churches still ignore the existence of the Wheels of Wonders since they have not yet discovered them in the Bible, and the West has forgotten a name for them! The Wheels of Wonders not only appear by their “New Age” Sanskrit names in the West but were unconsciously recalled in ancient symbols for protection (Mediterranean), lighthouses (worldwide), and annually celebrated, for example in Sweden. Furthermore, they are sacred but forgotten reminders in their physical form (symbols), e.g. in the Rosetta of the great cathedrals of Europe! The congregations literally look at a Chakra symbol without knowing it and thus may deny the Wheels’ existence! Using diligent research, John Bigelow Loveland MMsc, points out the wonders each Chakra can perform, being the etheric flowers from a powerful world beyond the physical: from the world of the meta-physical (meta, from Greek beyond). Yet the basis for any metaphysical experience of the Chakras is still in us, for they are anchored in our physical organs. We do not have to be anxious to regain the power of the Wheels, we only have to remember! The book by John Bigelow Loveland MMsc, Wheels of Wonders, so eloquently written, clearly proves the point. Key Words world hunger, vigor, biodiversity, GMO claims, GMO consequences, modern agriculture, food security, the temporary U.S. law FAP, history of agriculture, traditional farming, food production, food self-sufficiency, reduction of herbicides, natural habitat, arrested cows, GMOs in India, food-thinking, drinking water, GMO super bugs, trees, GMO labeling, Monsanto, Syngenta AG, BASF, Bayer, elimination of pesticides, health effects of herbicides and pesticides, inflammation, environment, market variety, wild plants, patented non-food, sustainability, needs, transparency, agroscience, glyphosate, Roundup, mono-cultures, multi-cultures, loss of varieties, productivity, economy, species, extinction, GMO and cows, GMO concerns, MIT, FAO, natural, Starbucks and GMO, genes and food, Vietnam’s herbicide fields, Agent Orange, food concerns, Indian farmers, GMO seeds, seed of suicide, moral utility requirement, European Patent Convention (EPC), weeds, pests, FDA, transgenic food, transparency, Gupta paper, Cartagena Protocol (CP), World Food Summit, livelihood, stakeholders, profit patterns, people power, initiative, Dr. Vadaba Shiva, Bt cotton, community seed bank, organic, debt, self-responsibility, The Road Less Traveled, Scott Peck, lobbying, ancient texts, law, advertisement, breeders, injury, Green Revolution, artificial fertilizer, high-yield crops, regulations, food sovereignty, ago-ecology, La Via Campesina, International Monetary Fund (IMF), World Trade Organization (WTO), plant genetics, property rights, Convention on Biodiversity (CBD), food security crisis, UN High Level Task Force on the Food Security Crisis (HLTF), Group of 8, caveat emptor rule, detecting GMOs, U.S. patent law, ethics, Albert Einstein, temporary rider, CCAA/FAP, plant disease, organ defects in GMO-fed animals, obesity and GMOs, GMO-wheat obesity. Description Genetically engineered foods, GMOs, heralded a new future: feeding humankind, relieving poverty by greater harvests, reducing the need for water, and sustaining the environment by requiring less herbicides and pesticides. Yet, did these promises come true or did these promises turn farmers’ land into disaster-laden super-weed and super-bug fields after three years of use, and drive farmers in India to commit suicide by the thousands? Read what this scientific GMO researcher found out – mainly from overseas reports. Could the failed Green revolution and the U.S.-use of Agent Orange (defoliation agent, like herbicides) in Vietnam have consequences for the genome of people and animals, even after decades? Could the results from such attempts be a warning concerning the DNA and GMOs? This informative book looks at the pros and cons of GMOs, at lobbying and legal ramifications, as well as at traditional farming and the ecosystem, sustainability, transparency, world-wide biodiversity efforts, and food security in order to solve the hunger problems of this rich planet. A must-read book for anyone who intends to eat today and tomorrow to be informed. Description The name of the land in the middle East is the Holy Land, an acclaimed sacred area for Jews, Muslims and Christians alike. Yet, the Author wonders why peace is not forthcoming in the Holy Land for the sake of its holiness. Having pursued the development in the Holy Land since the declaration of a state of Israel in 1948, the Author presents data from the ancient history of the land to recent developments in 2014. He analyses, why the acknowledged founding father of both, Jews and Arabs, the “Iraqi” Abraham, fared extremely well in the Holy Land as a stranger from Assyria and was called Lord and Prince by the Natives, whereas his descendents, the modern Israelis, are seen as intruders by the long-term-resident Palestinians. The author clarifies that “the Palestinians” are comprised of an Arabic/Muslim population, but also of Christians, Jews, African Jews, and people of other faiths or of no faith at all. They all have lived in relative peace together in the Holy Land, the historic Palestine, before the declaration of a state of Israel. What are the main causes for the end of peace with the declaration of the state of Israel? John Loveland MMsc discusses three possible solutions for peace commonly talked about: the one Jewish religious state, the two-state solution, and the one-democratic and secular state, making obvious their advantages and disadvantages for the people involved. Surprisingly, the author adds a new factor to a possible peace solution – the Human Factor – that for decades has been neglected in peace talks and thus no peace talk has led to lasting peace in the Holy Land. The Human Factor involves two proven methods for nonviolent, social understanding (Dr. Marshall Rosenberg) and collaboration (Dr. Tom Wolff) that could lead to a peaceful living situation for all people in the Holy Land. Selected images richly illustrate the points and prove the facts on the ground, demonstrating that the democracy-based Universal Declaration of Human Rights, signed by Israel and its main supporter, the U.S., was signed in 1948 but is neither adhered to by the Israeli government nor by the U.S. The author’s suggestion of heeding the Human Factor when working toward a solution may have enormous impact for the Holy Land and the world. This book is for all of you who are involved in or have an input or influence in this situation in the Holy Land, or are purely concerned with peace in the Holy Land and in the world, wanting to be informed about what the news may have neglected to present. Download innerhalb von 24 Stunden nach Kauf. ﻿Das eBuch, Zeitalter des Gefühls beschreibt im Detail wie das Programm von Dr. Host Heinze in Deutschland aufgebaut war, was es beinhaltete und wie es als Muster zur Reform von Drogeneinrichtungen, Nervenheilanstalten sowie Gefängnissen und sogar für Kindergärten verwendet werden kann. Die Not besonders der Drogenabhängi-gen, aber auch der in psychiatrischen Anstalten und Gefängnissen Eingesperrten ist gross, denn wie das eBuch zeigt handeln sie aus einem inneren Drang, der frühere negative Erlebnisse wiederspiegelt. Z. B. entdeckte Dr. Heinze, dass diejenigen die zum Gebrauch von Heroin neigen, vorgeburtlich eine Erstickungsangst erlebten, wenn ihre Mutter dem heranwachsenden Wesen ohne ihre Schuld nicht genug Raum geben konnte. Die spätere Heroinsucht wird meist sogar durch Körperzeichen angekündigt! Durch Heroin erlebt derjenige als Teenager oder als junger Erwachsener am Ende das vorgeburtliche Schicksal der Erstickung, um es emotional wieder zu erleben (primaln) und zu verarbeiten. Nur ist Heroin ein “russisches Roulette” und trägt nicht zur Problemverarbeitung bei. In natürlich veränderten Zuständen des Bewusstwerdens jedoch erlebt der Leidende die alten Erstickungsängste, kann sie mit Gefühlen verbinden, verarbeiten und heilen. Der Schlüssel zur Tiefe und gefahrlosen Heilung liegt im Fehlen von Zwang oder Nötigung durch den Therapeuten, im Nichtvorhandensein von Strafen, im Arbeiten mit dem Unbewussten und in der Sicherheit der Gruppe, die in anderen Primärtherapien bisher als unbedeutend bezeichnet wurde. In Zeitalter des Gefühls ﻿ zeigt die Autorin aus eigener Forschung, dass die Neurose keine Erkrankung ist, als die sie immer noch in Fachbüchern bezeichnet wird. Vielmehr stellt die Neurose den inneren Drang dar, gesund zu werden. Mit der Unterdrückung des Wiedererlebens von traumatischen Ereignissen verfestigt die Gesellschaft die heilende Neurose und hält den Leidenden mit dem wachsenden Druck krank, sei es an Körper, Geist oder Seele. Am besten wäre es, Kindergärten für die Kryptische Primärtherapie™ zu schaffen, in denen Kinder primaln und verarbeiten können bevor ihr traumatisches Erleben fester im Unbewussten eingeschlossen wird. Wir würden eine neue Gesellschaft erleben, wo es kaum Lügen, Kriminalität, Bestechungen und Kriege gäbe, wo das verdrängte Gruppenbewusste des Menschen das Teilen, Zusammenarbeiten und Helfen zur weltweiten Charaktereigenschaft machte, wo egoistische und zerstörerische Handlungen nicht mehr auftreten würden weil jeder das täte, was allen anderen samt Tieren, Planzen und der Erde zugute käme – könnte dies das Paradies auf Erden sein? Das eBuch, Zeitalter des Gefühls, ist besonders für die geeignet, die ein größeres Verstehen der Leidenden an-streben, eine Reform von Kindergärten, von Kliniken für psychisch Kranke & Drogenabhängige sowie eine Reform von Gefängnissen und von Nachkriegstraumatherapie. Dieses eBuch, gewiss seiner Zeit voraus, ist für diejenigen die über eine Reform der Gesellschaft nachdenken wollen: eine Reform die keine Strafen und Angst vor Strafen mehr kennt! Bitte besuchen Sie uns bald wieder zur neuen NewAncientSecrets™ eBuch-Erfahrung. Please visit again for your next NewAncientSecrets™ eBook experience. Description This eBook on the Origin, Herstory and History of the Heaven and Earth Mother allows deeper insights into the ideas and philosophies of our Stone Age ancestors, why and how they created symbols and periodically adjusted them to their understanding. The origin of symbols in sacred energy (original research) is shown here, using the Heaven and Earth Mother as one example that resonates throughout the world, hidden in “mysterious” symbols, then reappearing hundreds of years later, inexplicably for science. History and the preceding “Herstory” give insights into the spiritual connection, ideas and awareness of people and their loss of the divine, not printed yet in dictionaries and school books. The work of Professor Dr. Herman Wirth gives invaluable support by its precise data base of ancient sacred art documented throughout history and herstory. Professor Dr. Wirth was one of the most ingenious scholars of our time in the field of ancient symbols. He founded Ursymbolforschung (Primal Symbol Research), and with his life’s work retraced the history of symbols to herstory. His accurate results on the herstoric time of the Great Mother are based on integrative science and prove that the ancient symbols could only come from the North Pole! Bara decoded the “mysteruious” symbolic messages and found that there is but one origin of all healing religions (original research). After all, the term religion comes from Latin religare, to reconnect – with the divine in us. The holy symbols are now used as profane and materialistic items for daily life use, like the baton or barbell, symbols of our sacred life energy – with forgotten origin. Knowing the sacred origins of symbols within each, humankind may return to its divine roots. Illustrated, entertaining, educational, for all ages. Secrets of the Spiritual Path – Little to read, a life time to think about. Description One origin of hole, jewelry, pots, money and bagel? Yes, in you! Sounds crazy? Read this and learn more about the long forgotten secrets of the spiritual path by exploring the mahnificent art of ancient Mimbres clay pots. Living around 1,000 AD in the American Southwest, these people left their entire pottery library of spiritual secrets for us to read – if we could only read the symbols! Yet, as if "out of their mind," the Mimbres knocked a hole right in the center of the precious pots – inexplicably - until in 1985 The wHole Book on Mimbres Pots revealed the spiritual secret of the hole (that enhanced the pot) once known in the entire ancient world. Yet we, the spiritually impoverished descendents merely remember the hole by the adage, "All I need is a hole in my head." This strange saying evokes the divine energy hole of the mysterious term “hol(e)istic healing” and of the Bible and Kabala! Potentially, as the adage recalls, the hole is also in your head! The wHole eBook on Mimbres Pots partners the native hole with holy hole symbols from around the world and from all ages, together yielding their meanings as was not found – until in ca. 1979 Bara rediscovered the ancient secret of the hole. This eBook also reveals the origins of other sacred symbols, for example the staff, the heart, the nest and the lucky straw, the cross or the bird, which like the hole are symbols of our own divine energy, our life energy. Stone Age art and modern technique made our sacred life energy visible as shown in this eBook. It was this godly energy which our forbearers cared most about, finally baking the hole and wearing it as jewelry! From 1985 on, The wHole Book on Mimbres Pots sold for $10.00 (soft cover, 55 pages), however it was later listed on the Internet for up to $130.00, used! This eBook is an extended version of the first edition and is best read from A to Z: enjoy the many artful images with little to read but a life time to think about! This eBook is educational/fun reading for children and adults alike. Description Is it the beautiful and thoughtful art of the Madonna, which Antonia has expressed so expertly, or is it the accompanying and thought provoking text by Bara that makes you want to have this book? Antonia’s outstanding art can be used for pure delight or for uplifting meditation alike, whereas Bara’s text addresses Mary and her life with child, as well as historic Mother goddesses and the reason for the shift to father societies and father religions after millennia of adored Mother goddess. This book offers prayers to the Madonna and discusses if virgin births (parthenogenesis) is possible, and the probability that Jesus was in India. Parallels between Mary and holy women from other cultures are amazing, as are some similarities in the lives of Christ and Krishna. Once you have received this book for one reason, you will find the others enjoyable and may want to look at this book time after time as source of inspiration. Revealed secrets hidden in the symbols of Sacred Scriptures like Bhagavad Gita, Bible, and The Egyptian Book of the Dead. Only practice could discover their holy origin, only practice may convince. Symbols do not always mean the same: they were used to prevent outsiders from gaining knowledge of a spiritual or religious group. The Bible mystically states that there are things that are only explained and taught “eye to eye.” Since the Romans wanted to hinder that what creates inner peace. The eBook, Phenomena of Mysticism – UnSermoned, shows that the ancients cared about mystical phenomena and that the mystic experiences, reported in the Bible, can still be experienced by modern people though meditation: we have all the tools within us. This book brings descriptions, images and exercises that may help to regain the ancient science of mysticism, for nothing can convince us that “the other worlds” are real, but by experiencing them. The rediscoveries of the origin of ancient symbols from decades of original research, finally allows to understand Bible passages which would not make sense without knowing their origins. It is a book for all who like to inquire into what materialistic science denies: the world beyond the physical, right in our middle, in us. It is a book which no Priests, Pastor, or Rabbi can afford to overlook: it gives all new insights for their sermons on true Bible meanings of certain symbols and phenomena. After all, the positive “New Age” is all in the Bible and every ancient healing religion ahs kept a mosaic part of the knowledge. In this book, many insights from all around the world are coming together to point at a One World Religion that was once followed and understood! How Loving Are Scorpions? Where Do They Live? Can One Neutralize Their Poison Quickly? Description The Scorpion eBook, educating about the secret life of Scorpions, is a book for children and adults alike. It tells how and where Scorpions live, why they sting, and why they are the originators of the Native American Story Teller Mom. The Scorpion eBook equally informs about the wedding dance of the Scorpions, about their sacredness in ancient Egypt, why they are related to the mysterious “Third Eye,” and how to make houses Scorpion proof. Over 130 Scorpions visited the Author while living in a mountain cabin. They were the best “pets” in the cabin, outperforming snake, chip monks, noseeums and “lemon beetles” as guests. Read in The Scorpion eBook what Bara came up with to quickly relieve two Scorpion stings, and how to make a sting kit for yourself. Entertaining, practical and educational! 4 Where Do Scorpions Live? 7 Would My Sting Zapper Work? Upcoming ePublications will be announced here. All ePublications available on this website for purchasing and downloading are exclusively offered by NewAncientSecrets™ and are not available anywhere else, except for authorized sellers (KINDLE). Please make sure sellers are authorized. These eMaterials are based on original research of many years and offer diverse topics and information, hard to find otherwise. • by purchasing/downloading the products you agree fully with the terms. If you need technical assistance with this website, contact the webmaster. Although we value your input, a reply cannot be guaranteed.